Join our academic family and accelerate your learning! The Club Med Academies will use the most progressive, innovative techniques to provide a state of the art education that is individualized for each student/athlete. The Mission of the Club Med Academies School is to create an elite private school that attracts domestic and international families for the academics and Sport that support reaching their personal and professional goals. With an emphasis on blended learning, Club Med Academy’s academic program engages the student/athlete in the larger global community by emphasizing that learning is not limited to the classroom. Academic excellence will be achieved by seeking to explore, pursue and implement best practices in education. Implementation of best practices will result in continuous changes to instruction with an on-going emphasis on individual education and incorporation of technology. The result will create a student-centered learning environment that encourages all student/athletes to reach their academic and athletic potential producing graduates that have access to universities with the highest academic standards. The philosophy of the Club Med Academies’ academic program is to develop champions in the classroom with personalized programs and guided and exploratory learning that teaches critical thinking and life skills. At Club Med Academies, we are strong believers that a dynamic learning culture is achieved when the soft and practical skills of an individual are developed, then applied and measured within a competitive platform. Individualization, skill development, and competitive competence are at the forefront of CMA’s educational philosophy. We value the strong connection that our school makes with its families, and are pleased to have the opportunity to share the history and vision of Club Med Academies with you. With more than 35 years in education, our blended approach ensures those who participate receive an excellent education, have the opportunity to attend some of the finest universities in the United States, and become life-long learners with a keen interest in high achievement. 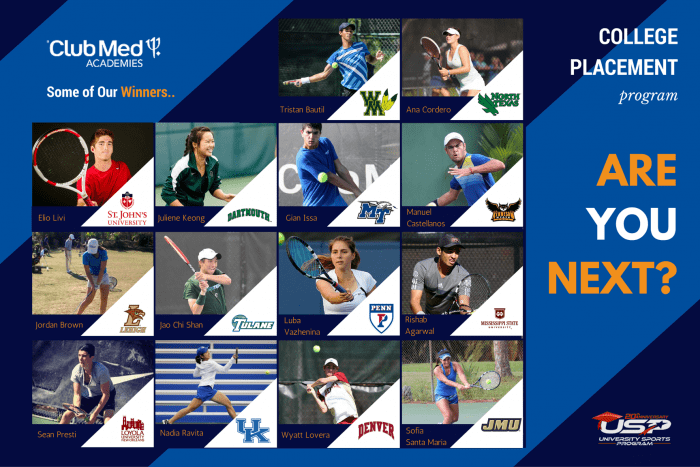 Club Med Academies and its principals have placed hundreds of students in colleges and universities throughout the United States, many on athletic and academic scholarship. The CMA model for education incorporates and integrates a blend of resources and materials to create one of the most amazing learning environments in the world. Our onsite school provides a highly-regimented in class delivery program, based on a personalized “Academic Road Map”. Utilizing an individualized and blended approach, each student’s curriculum is customized and provides the academic springboard for our on-site academic coaches to teach, facilitate, and monitor. We believe that a positive learning experience is a result of open and ongoing communication, regular submission of work, and a partnership between students, parents and our academic coaches, teachers and staff. 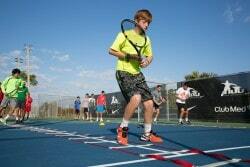 Student athletes learn more with Club Med Academies personalized programs. Our mastery-based, personalized approach takes place within our various on-site Think Labs. Researchers and authorities in education suggest core academics, coupled with an area of specialization (sports and arts), delivered in 1.5 to 2 hour training blocks throughout the day and evening, contribute itself to the ultimate learning environment. Club Med Academies stands securely in front of this market trend in education. Revolutionary and research based, with the body and mind connection at its core, Club Med Academies provides schooling 6 hours per day Monday through Friday with on-site sports specific training weaved into the day. they may continue with 2 hours of class and 3 hours of sport training in the afternoon. Evening, teacher facilitated, Think Labs are also provided for students to give additional support and opportunities for learning. Students also have a variety of college prep academic design options. Each academic plan is carefully tailored based on the student’s talents, skills, and educational experiences. Extensive and exceptional course and curriculum options for the college-bound student are available including Honors level courses and labs as well as, Advanced Placement (AP). The course plans are created so that successful completion prepares our students for college-level courses at the most demanding colleges and universities. We also offer academics through our nearby offsite school. This option offers a more traditional classroom and academic text book based delivery and allowing our students the choice of a traditional schedule with school in the mornings and sport training in the afternoons. Students attending our off-site schools pursue their academic goals on other campuses in the morning and then are transported to our Sandpiper campus for lunch and their athletic pursuits and training’s in the afternoons. Our academic team works closely to help support each student through collaboration and conferencing with each academic partner. And with our evening on-site educational extension options, students at Club Med Academies work with our teaching team to support them with their homework, projects and other assignments that have been given. Join our dynamic learning community and embark on the best possible future! Enrollment is available year-round!